Twenty-four percent of Republicans in December are satisfied with the way things are going in the U.S., up from 17% last month. 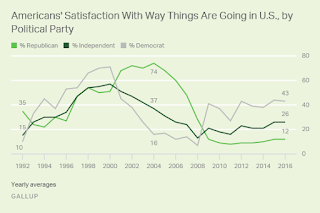 While still low overall, it is Republicans' highest satisfaction level since right before the 2008 presidential election, which ended eight years of Republican leadership in the White House. Republicans' anticipation of President-elect Donald Trump's transition has likely boosted their satisfaction with the nation's direction. 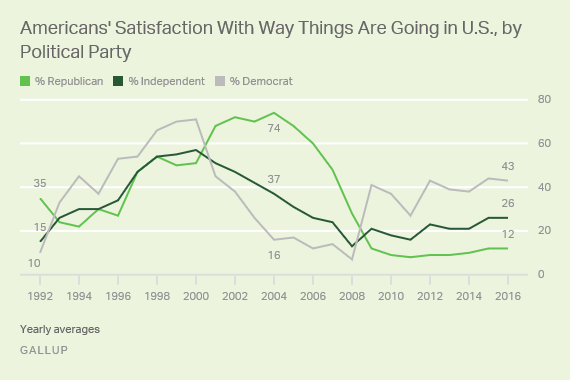 Although Democrats' satisfaction levels have dipped recently, their 2016 average (43%) is still higher than that of Republicans (12%).